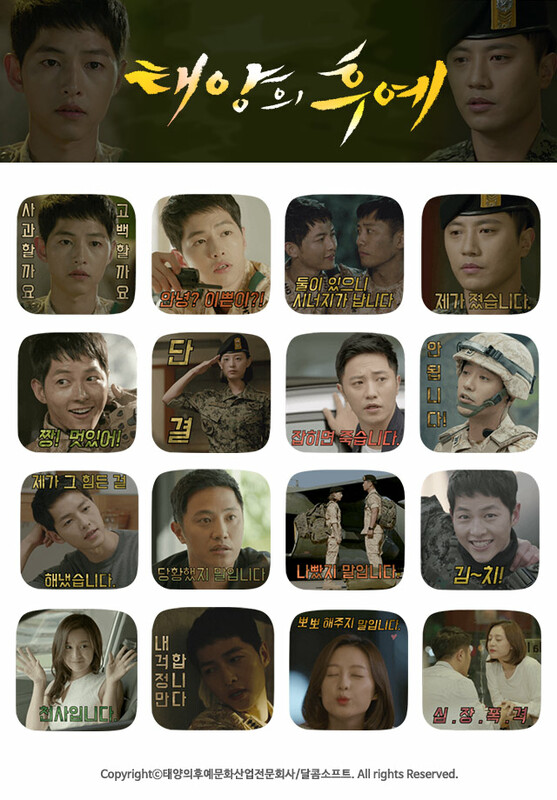 ﻿ [e뉴스페이퍼] "Sons of the Sun" emoticon surprise release! "After this time only to see" the descendants of the sun. [e뉴스페이퍼] "Sons of the Sun" emoticon surprise release! "After this time only to see" the descendants of the sun. The "Sons of the Sun" will be released via KakaoTalk emoticons . Today ( 13 days ), KBS 2TV drama ' Descendants of the Sun " (a play Kim Eun-sook , gimwonseok , directing yieungbok , baeksanghun , making the sun descended from the cultural industry professional company , NEW) is , the firm thanks to the hot popular tracks yusijin ( Song Joong-gi ) seodaeyoung ( Shrine ), and released a lieutenant yunmyeongju ( Kim Ji-won ) the character emoticon " after this time ' Sons of the sun " view only ". "Sons of the Sun" composed entirely of military character KakaoTalk emoticons pulled capture the humor of the situation between the upper and lower ranks of the characters , " says " The best mantra half , etc. , as well as fun to watch ten minutes , raise the military expressed witty conversation while loading peun added a fun place to write . According to the manufacturer side, the ' Sons of the Sun " emoticons dwaetdago was born of the consideration of the item that you want to repay the unprecedented love for drama ease of use in everyday life. From today (13 days) " to see after this time only " Sons of the Sun , "is connected to KakaoTalk emoticons store, it may be purchased . Meanwhile, the " Sons of the Sun " ahead of the only two times to jongyoung is not to imply roll over until you notice coaster , rapid deployment and an end was amplified questions about the ending. Today ( 13th) night, 10:00 KBS 2TV 15th broadcast. ‘태양의 후예’ 이모티콘이 카카오톡을 통해 출시된다. 오늘(13일), KBS 2TV 수목드라마 ‘태양의 후예’(극본 김은숙, 김원석, 연출 이응복, 백상훈, 제작 태양의 후예문화산업전문회사, NEW)가 뜨거운 인기에 힘입어 대위 유시진(송중기), 상사 서대영(진구), 중위 윤명주(김지원)의 캐릭터 이모티콘 “이 시간 이후로 ‘태양의 후예’만 봅니다”를 출시한다. 군인 캐릭터들로만 구성된 ‘태양의 후예’ 카카오톡 이모티콘은 등장인물들의 상하 계급 간 상황을 유머러스하게 담아냈고, 상반기 최고의 유행어가 된 “말입니다” 등 재치 있는 군대식 표현을 십분 살리며 보는 재미뿐만 아니라, 대화 도중 적재적소에 쓰고픈 재미를 더했다. 제작사 측에 따르면, ‘태양의 후예’ 이모티콘은 드라마를 향한 전무후무한 사랑에 보답하고자 일상생활에서 간편하게 사용할 수 있는 아이템을 고려하던 중 탄생하게 됐다고. 오늘(13일)부터 “이 시간 이후로 ‘태양의 후예’만 봅니다”는 카카오톡 이모티콘 스토어에 접속, 구입할 수 있다. 한편, 종영까지 단 2회를 앞둔 ‘태양의 후예’는 롤로코스터급 전개를 예고, 끝날 때까진 끝난 게 아님을 암시하며 결말에 대한 궁금증을 증폭시켰다. 오늘(13일) 밤, 10시 KBS 2TV 제15회 방송.